Fair question, it has been quite a run over the last 18-months. 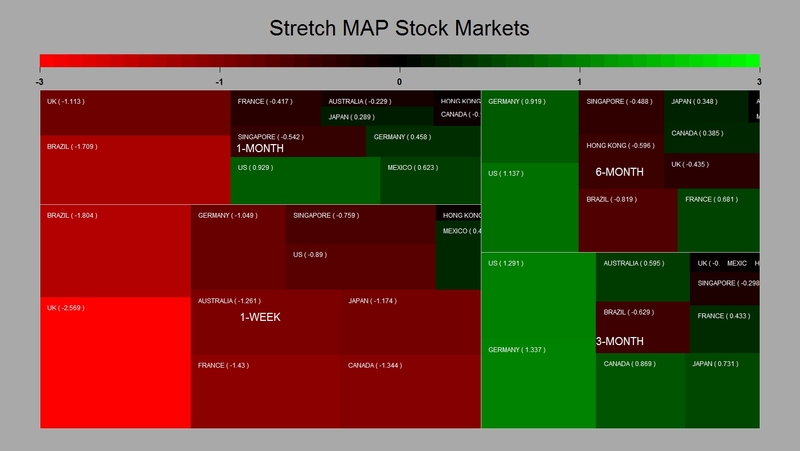 Those moves may look atypical to some because we forgot what was a good old fashioned bull market whilst experiencing the previous bond rally who has come to term…The MAP below shows the T_Stats for major stock markets over various time horizon… everything above or below -1.6450/-1.6450 would breach a 95% interval of confidence on a normal distribution… nothing out of the ordinary there…..
Keep on buying then ! 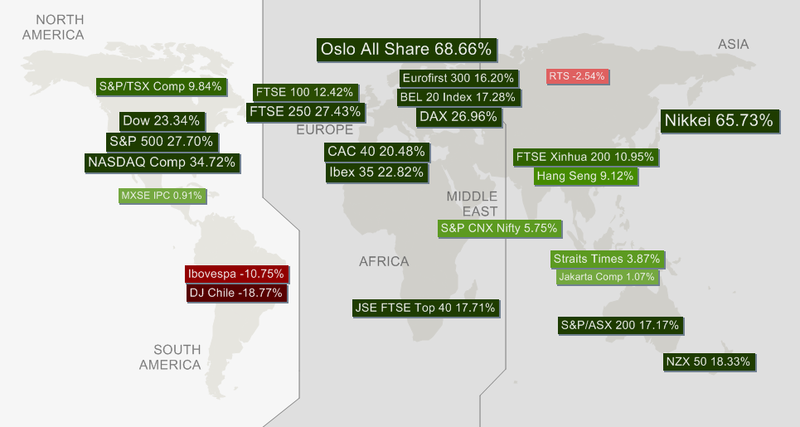 Posted in Stock Market on December 5, 2013 by Pierre. 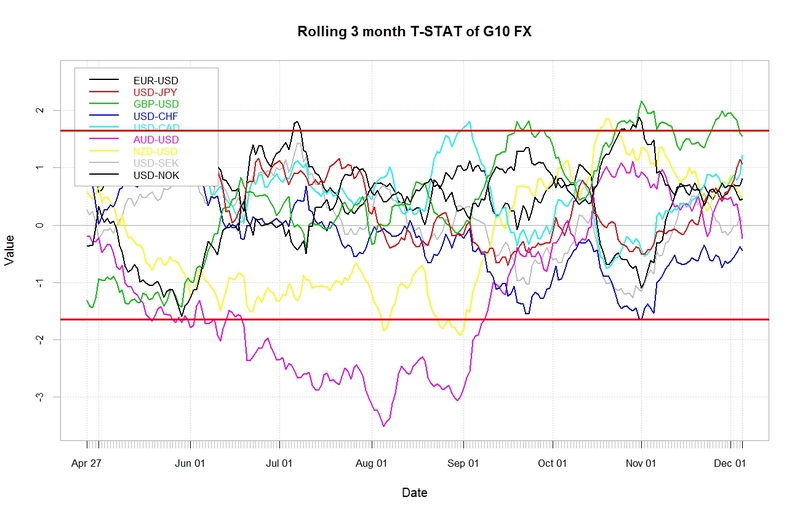 Ok we have had a few moves in FX over the last weeks and as liquidity is about to dry up I though it would make sense to look at how significant the moves in the main dollar crosses were…The chart below shows what were the T-Stats for the G10 US$ exchange rates across different time period…. 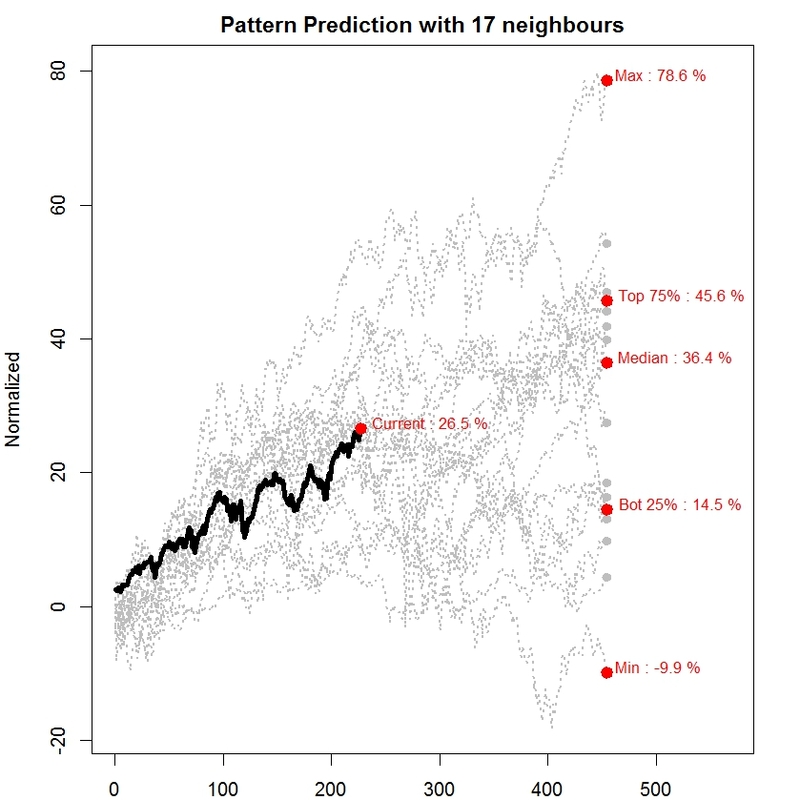 Nothing looks out of what you would expect under the 95% confidence interval of a normal distribution…. so I guess I would stay with the trend… I.e long USD-JPY & EUR-USD and sell commodity currencies…..
Posted in FX on December 5, 2013 by Pierre. 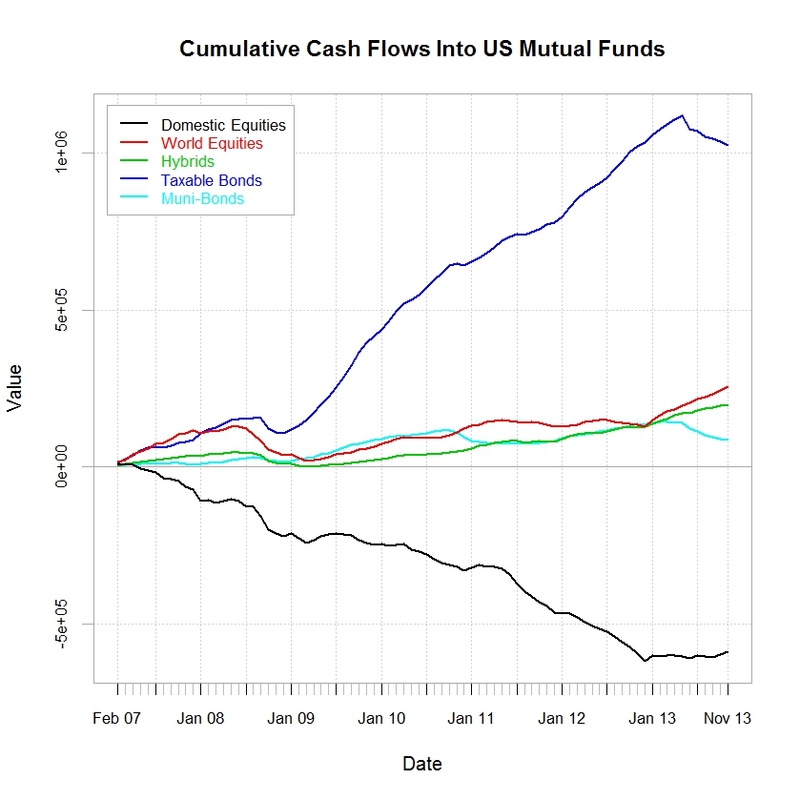 It Is Still Buy Equities and Sell Bonds…. Ok the latest ICI data release is out again , so here are my favourite charts. 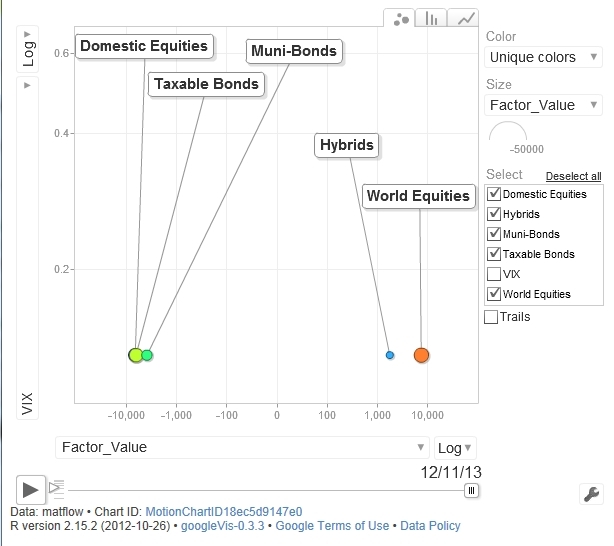 An yet again no surprise it is buy international and domestic equities and sell bonds. 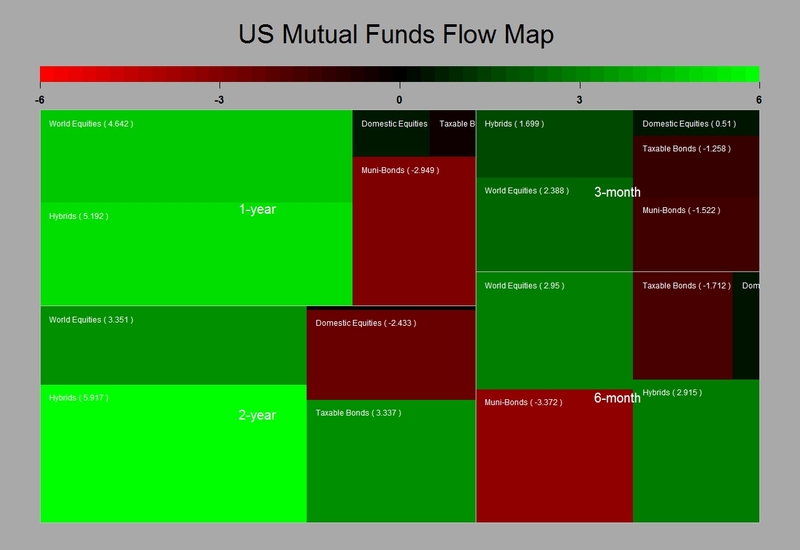 Now it has been 12 months that US investors are buying equities and 6 months that they are selling bonds (and my contention is that we have the same phenomenon in the UK) . What do you need more as a signal ? The great rotation is just starting, so there is still time to come on board…. What really fascinate me is the amount of investment in bonds remaining to be culled by the private investors…even if you think within a balanced portfolio framework we should have a 60% bonds /40 % equity as a point of reference for a neutral the asset allocation… the chart below tells me that we are quite far from this level…..so buy equities… as long it is not PIMCO because their revenues are likely to be dented significantly unless they can re-invent themselves as a global equity manager…..
Posted in Asset allocation, Bonds, Stock Market on December 5, 2013 by Pierre. As we are nearing the end of the year and that typically we should see liquidity drying up as well as rumors about a nasty retracement in equities abounding I thought I would have a quick look at some of my pointers. 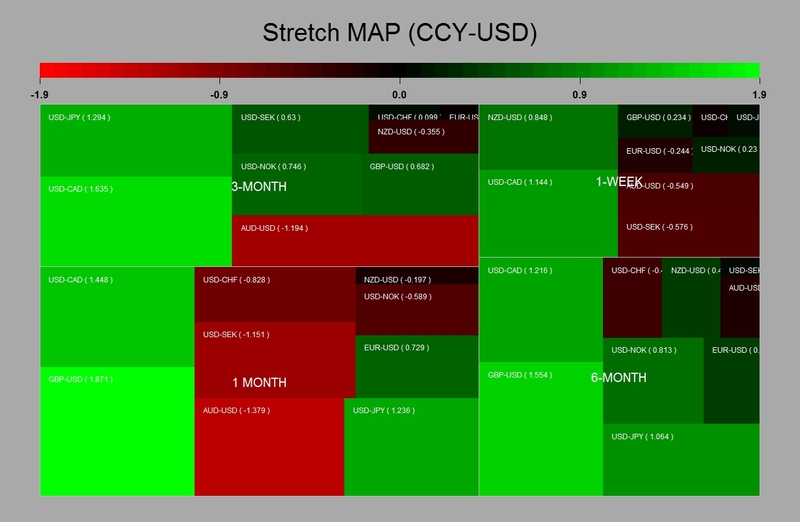 Clearly it has been a nice run so far and central banks have been very helpful in supporting the current bull market. The latest data from the ICI demonstrates that there is no stopping American investors buying international equities and selling bonds. And my thought is that the situation is similar in many of the major economies which are on their way to recovery. I guess the risk of a major retracement in the bond markets in the next couple of years is still a significant risk whilst upside likelihood remains limited so there is a strong rationale for a private investors to go bull on equities as the economy is picking up. 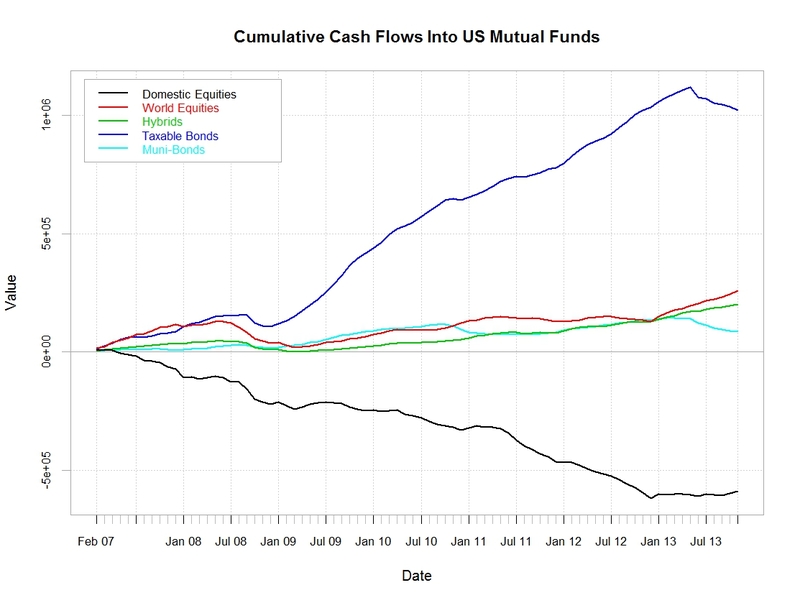 The chart below shows the significance of the inflow and outflow in US Mutual funds by asset classes and over various time horizons. 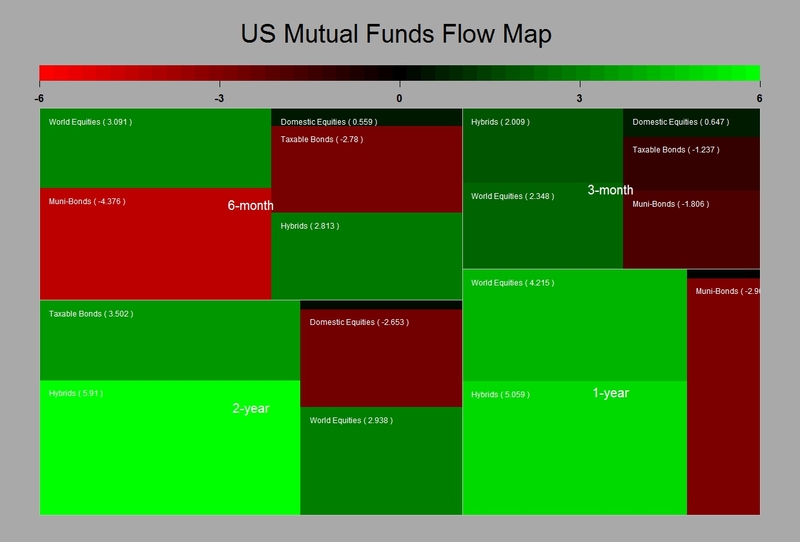 The greener the more inflows the redder the more outflows….Clearly we have been in equity buying mode for a while now. Despite the significance of the flows observed the dent made to the level of investments accumulated in bonds over the years remains modest so far. This is good news for the current rally as therefore there is still much adjustment to take place all being equal. Clearly what we will experience ahead will be dependent on future economic growth. Bearing in mind the track record of accuracy of forecasts made by economists and alike my view of a significant economic growth in the next few years based on the lagged response to the significant stimulus provided by major economies is as good as any. Over a shorter horizon I think it is fair to say that so far governments and financial authorities have done a relatively good job and that the green shoots of recovery are well established. My view is that central banks will be weary of adjusting their monetary policy too fast as they will want to maximise the likelihood of strong economic recovery and job creation. 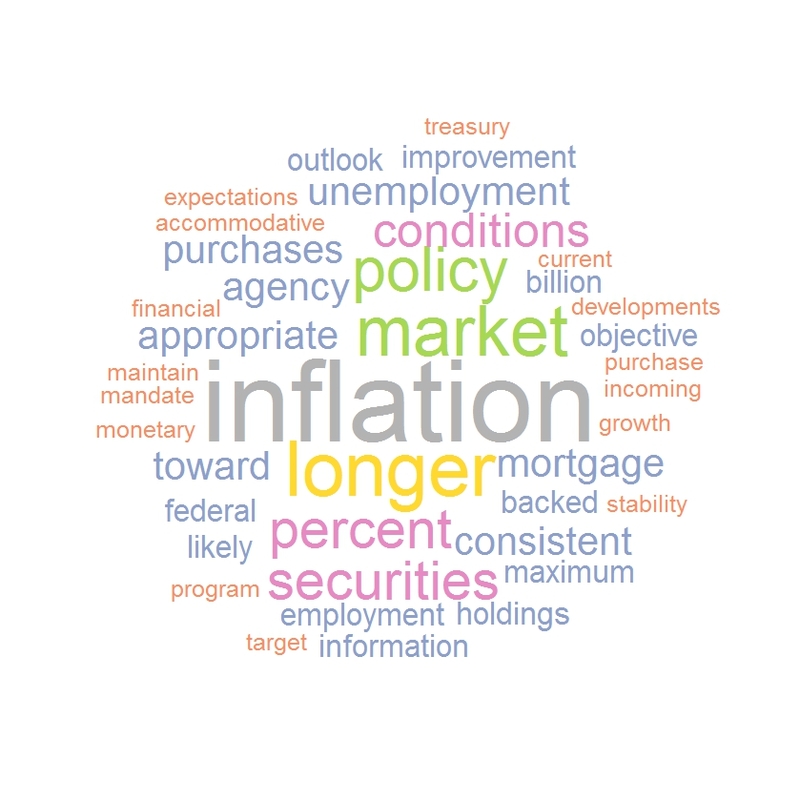 Inflation will definitively become acceptable if accompanied by strong growth. A scenario of higher nominal rates but not necessarily higher real rates should further promote flows toward equities. Lets face it what we are seeing is structural and we probably have another few years of equity beta coming our way. I acknowledge that we have had a significant upside in equity valuations this year if one takes exception of emerging markets. Most markets have had double digit returns that can t remain unnoticed to the average investor . So despite my bullish view emulated in the above this raises some issues about the market being possibly overbought. The chart below investigates the periods were the S&P500 has had a statistically similar run and plots what has happened in the following 250 days ( I use a sample of daily data spanning from 1980 to date). Clearly what we have seen is pretty much average in regard of past bull markets and from there the possibilities are broad we could retrace by close to 30% or rally by another 50%, if history is a guide at all. Meanwhile the VIX which should embed market expectations about possible risks remains well below its long term median. 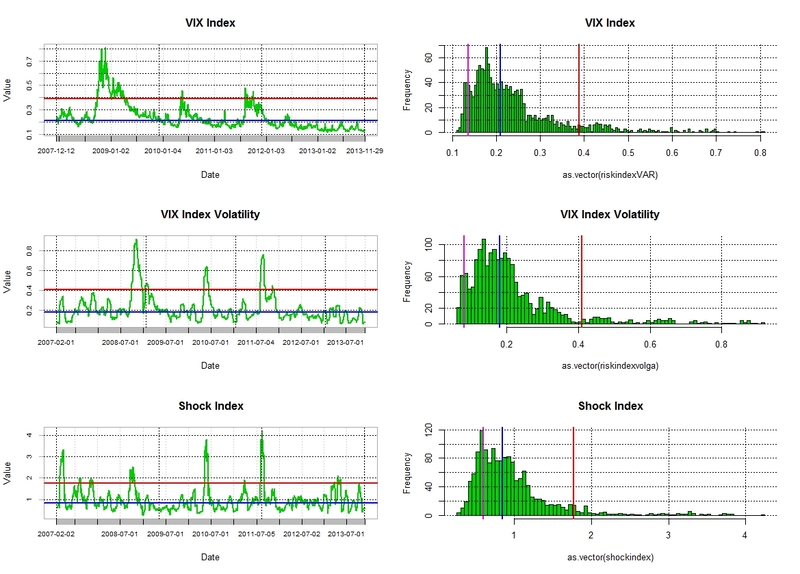 My other metrics of market risk Volga and Shockindex are similarly close to their historical low. This may indicate a level of vunerability of the market but also reflects that the flows going into equities are somehow dampening the market volatility. 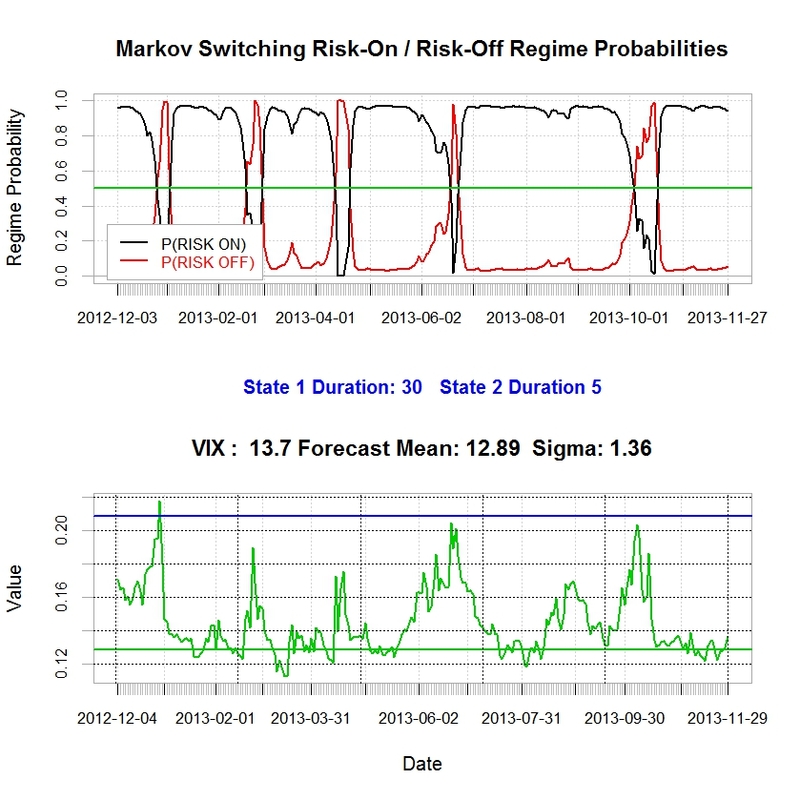 Finally my two-state Markov regime switching model still indicates that we are within a risk on environement (i.e long equity risk) and there are no sign of a change there. So I guess I ll stick to my bullish view and will keep my broker unhappy by holding my positions…. no commissions for him in December…. 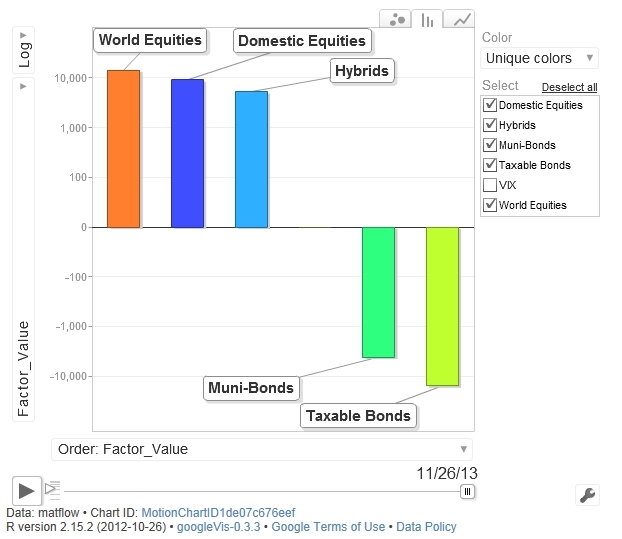 Posted in Asset allocation, Bonds, Market Risk, Stock Market on December 2, 2013 by Pierre.